We’ve already driven the Kia Soul EV at its UK launch, but what is it like to live with, and does it have a more practical range than rivals in real-life? Having some degree of electrification on our cars is the only way to achieve our emission reduction targets. Plug-in hybrids provide a practical overall driving range, but a small electric range, but pure EVs mean zero-tailpipe emissions – if you can cope with the limited overall driving range. 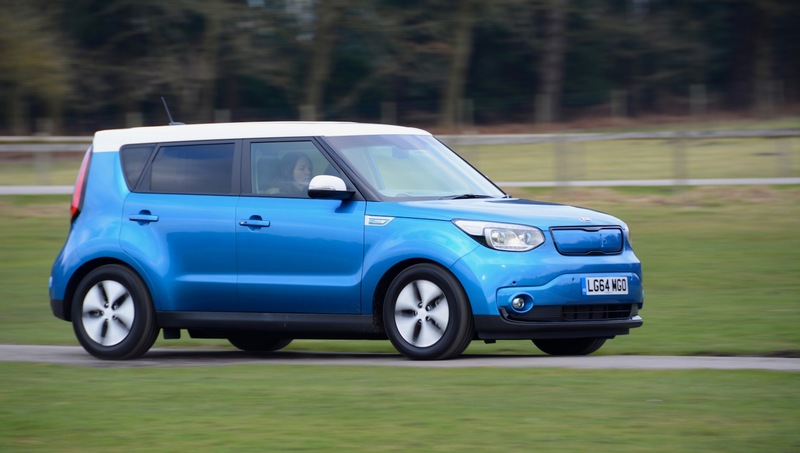 A number of manufacturers are bringing EVs to market, even with the prospect of small sales numbers; the Soul EV is Kia’s offering, and it promises a longer range than rivals, with an individual shape and styling. 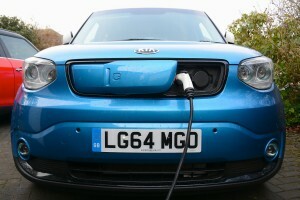 Two distinct types of electric cars are now emerging – ones that are designed from the ground up as electric cars – such as the Nissan LEAF and BMW i3 – and ones that are standard models with the petrol engine replaced by an electric powertrain – such as the Volkswagen e-Golf, and now the Kia Soul EV, which is built on the same production line as the petrol and diesel Souls. So this is a regular Soul, but with a 275kg lithium-ion polymer battery bolted underneath the floor and the electric motor (producing the equivalent of 109bhp) under the bonnet. The rest of the interior and exterior is virtually the same as a petrol or diesel Soul, apart from aerodynamic features such as the blanked-off front grille and special lightweight alloy wheels (the basic Soul body is not the most aerodynamic of shapes). There are also super-low rolling resistance tyres, which can reduce energy consumption by as much as ten per cent compared with regular low rolling resistance tyres. The electric powertrain has no impact on space inside the car apart from an 80mm higher floor for rear seat passengers, and luggage capacity is reduced by 31 litres to 281 litres to accommodate charging cables under the boot floor. The Soul EV’s interior heating controls can just be used by the driver only, to save energy. It also has an intelligent heating, ventilation and air conditioning (HVAC) system which includes a heat pump to recycle air that has already been heated or cooled within the cabin. 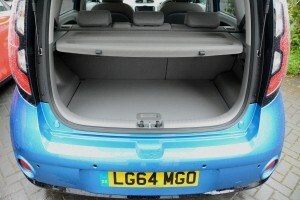 The interior can be heated or cooled while the car is plugged in, so saving battery power on the move. 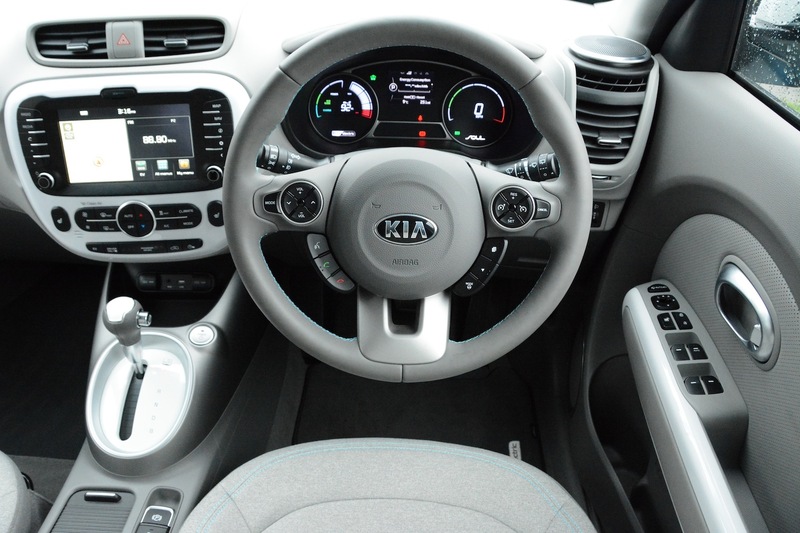 Kia claims that its battery has a class-leading energy density of 200 Wh/kg and an energy storage capacity of 27 kilowatt-hours, and there’s a heating and cooling system to keep it at an ideal operating temperature. 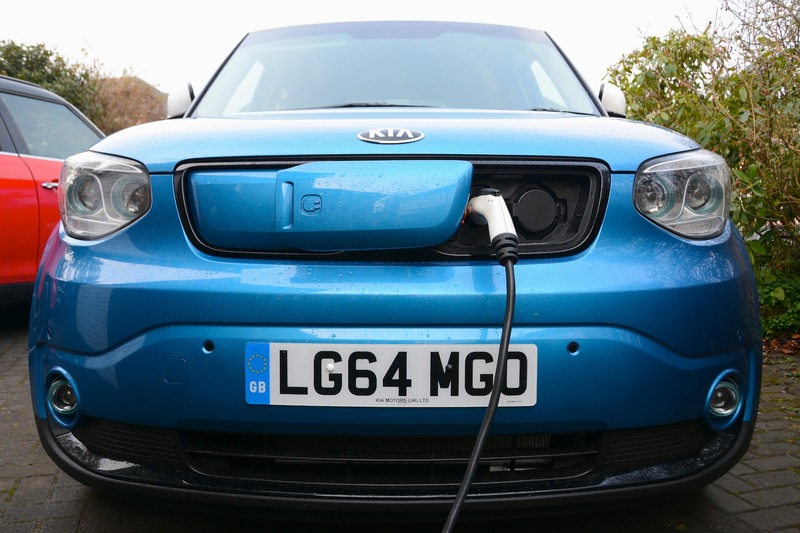 The Soul EV can be recharged using a standard domestic socket, a wallbox supplied as standard with the Soul EV, a public fast charger, or a public rapid charger. 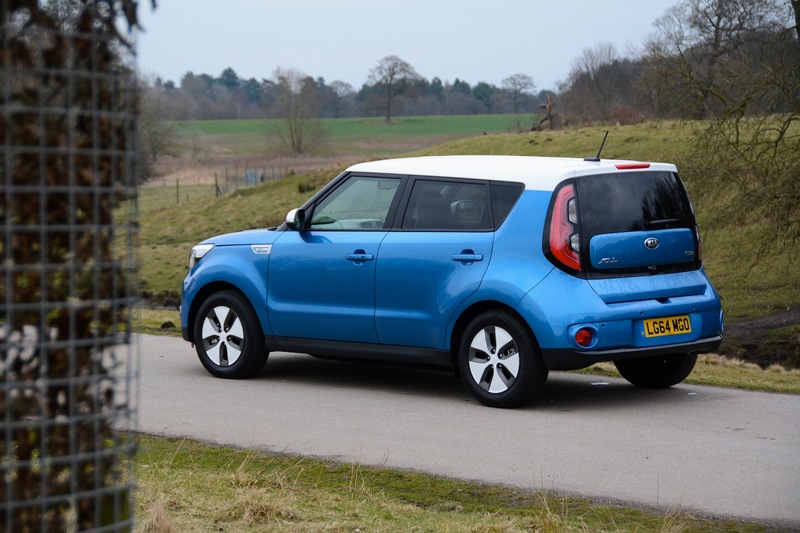 Using a UK 230-volt domestic power supply, the Soul EV can be fully recharged in 10 to 13 hours. With the wallbox or a public fast charge point, the time can be reduced to around five hours. Using a public rapid charger the batteries can be topped up to 80 per cent of capacity in 33 minutes. 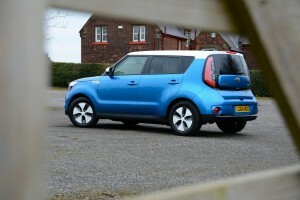 We previously drove the Kia Soul EV on its launch on a fairly short route in London, and initial impressions were good, but what is it really like to live with over a longer period, as part of everyday life? We drive a range of different cars every week, including petrol, diesel, hybrids and EVs, and it’s always the EVs that provide the best experience in urban driving. They’re virtually silent, very refined, have great response when accelerating, and with no gears or clutch, they’re easy to drive. However these are qualities that are common to all EVs, so how does the Soul differ? The key difference is that the Soul does genuinely appear to have a longer driving range than most rivals. We’re not talking about a huge difference, but when you need to cover 80 miles in one day, in a car that has a range of around 80 miles in real-life driving, an extra 10 miles range makes a big difference. You notice this most when keeping an eye on the remaining range during driving – the range displays of other EVs have a habit of plummeting under many driving conditions, whereas the indicated range left on the Soul EV remains much more constant. The outcome of the range not plummeting is that you find yourself not having to recharge the car every night – you can go two to three days without charging. Another practical benefit of the Soul EV is its spaciousness. Although based on a supermini footprint, because it is essentially a square box, it does have more room inside for people and luggage than most other EVs. Having a compartment under the boot floor for cables may reduce some of the official luggage space, but it’s a neater solution than having cables lying in the boot. It has a very clearly laid out dashboard which features an excellent reversing camera. 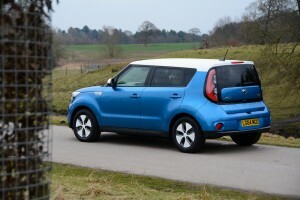 The Soul EV has a comfortable ride and decent handling, helped by the low centre of gravity due to the batteries, and the steering is well-weighted, but the brakes, due to focusing on regenerating energy, have a different feel to conventional petrol or diesel cars and take a bit of getting used to. 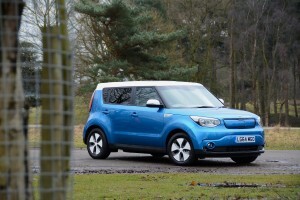 The main issue with the Kia Soul EV is its styling. The ‘normal’ Soul looks perfectly acceptable, however the EV version has features such as the blanked off grille, flat wheel covers, high profile, energy efficiency tyres, and in the case of our test car, blue bodywork and a white roof. Overall this gives the impression of a ‘cartoon car’. This contrasts to the likes of the BMW i3, which has super-cool styling. 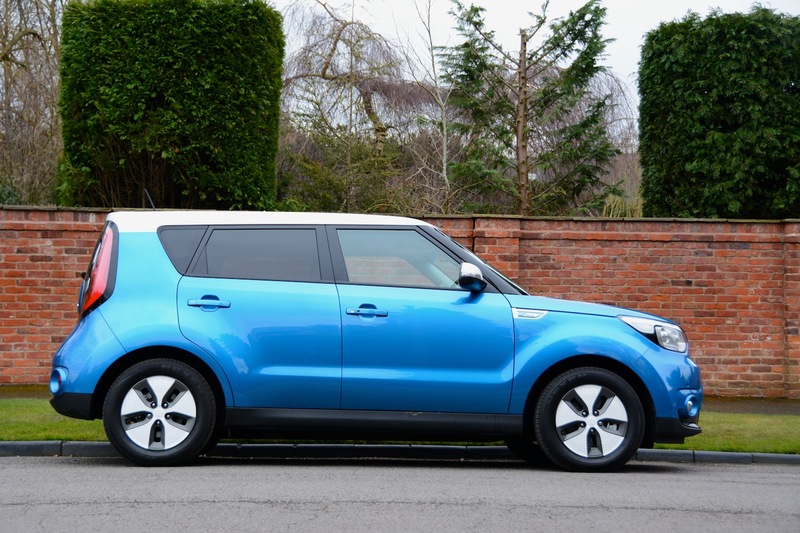 We would suggest that Kia needs to look at the styling of the Soul EV and make it less ‘eco’ and more desirable for both private and business buyers. 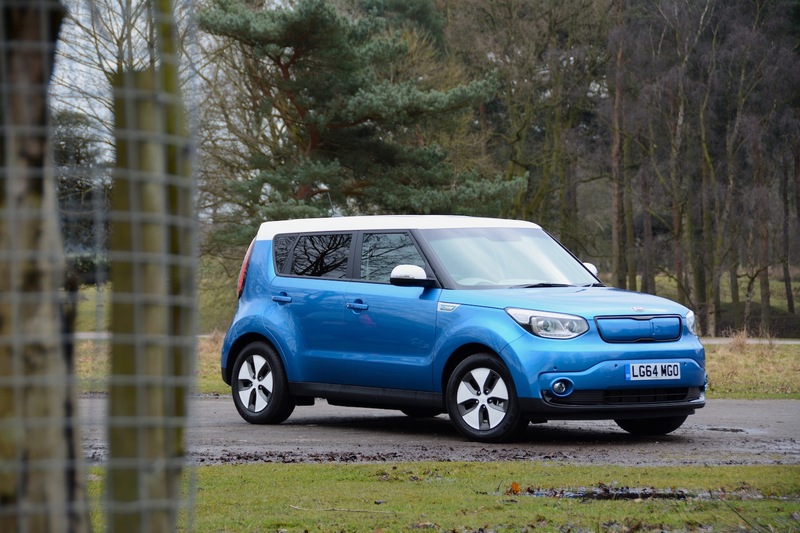 The whole point of living with the Kia Soul EV for a week was to find out what its range was in real-life, and to see if that was sufficient to live with. The official range of the Soul EV is 132 miles on one charge. Just like the discrepancy between official and real-life mpg figures, the same discrepancy also exists between official electric range and real-life electric range. On average over a week we achieved a range of 82 miles between charges. This is obviously less than the official 132 miles, but is better than some other EVs that we’ve tested, which have only managed around 64 miles in real-life. We would stress that this range was achieved after typical driving; we’ve achieved a 40% improvement on the official range of an electric car on the RAC Future Car Challenge event, so with very careful eco-driving, we’re fully confident that you could achieve a range of over 100 miles in the Soul EV (in an urban environment rather than in any higher speed driving). The trouble is, there’s usually not the time, the inclination or the traffic situation to drive in an eco-fashion consistently. Of course the big idea behind pure electric cars is that they have zero tailpipe emissions. It’s impossible to have missed all the stories in the media over recent months about the air quality problems in our cities, with diesel engines being responsible (particularly old diesel buses, taxis and trucks rather than modern diesel cars). Pure electric cars such as the Kia Soul provide a solution to this problem. However EVs can be accused of just moving the emissions problem from the tailpipe to the power station, so ideally electric car owners would charge their cars using a renewable energy source, which would mean both the car and its energy would be zero CO2. There’s only one Soul EV model and it costs £24,995 after the £5,000 government Plug-in Car Grant. You can choose between two colours, blue (with a white roof) or silver. Kia will also install a recharging point at your home if you buy a Soul EV – as long as you have suitable off-road parking. The Soul EV is no different from any other Kia in terms of the reassurance offered; it comes with a seven-year, 100,000-mile warranty. 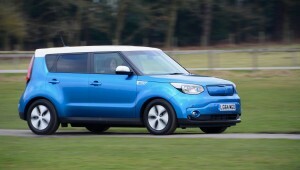 So, after a week of living with the Kia Soul EV, would we buy one? The first consideration has to be whether a pure EV is suitable for your driving needs. Pure EVs are ideal for use in urban areas, where they can help combat issues of air pollution. However off-street parking to allow charging is often a challenge in urban areas. Although an infrastructure of public charge points is being built up, all the statistics show that people mostly charge at home or work. So although the ideal is that a pure EV such as a Kia Soul is a person’s only urban mode of transport, the reality is that many EVs are bought as a second car, when there is also typically a decent-sized, diesel-powered estate car in the household. In this scenario cars such as the Soul EV are ideal for shorter journeys. The issue is whether the whole life costs stack up, which may be an issue if only low mileages are covered. From a business perspective, the Soul EV would be ideal for regular short journeys, and the company car BIK tax rate from April 2015 is just 5% (it was zero prior to this date). Although the purchase price is high compared to conventional cars in this class, running costs are very low – around one-fifth of a petrol car. 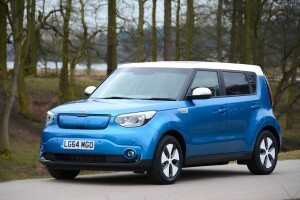 So, if you think a pure electric vehicle would be suitable for you, should you choose a Kia Soul EV? It has a better real-life driving range than some rivals, and it’s a practical shape. It drives equally as well as other EVs. On the downside, the styling may not be to everyone’s tastes. So after a week living with the Soul EV, overall it remains a perfectly acceptable car to live with if it’s suitable for your driving requirements, and it offers another choice in the fairly limited pure EV market place; it maintains its original Green Car Guide rating of 9 out of 10.